Heat oven to 350°F. Cut peanut butter cookie dough into 36 equal pieces; roll each into ball. On ungreased cookie sheets, place balls 2 inches apart. With fork dipped in sugar, flatten each ball slightly in crisscross pattern. Bake 8 to 11 minutes or until light golden brown. Immediately remove from cookie sheets. Repeat with chocolate chip cookie dough. In small bowl, mix frosting and peanut butter until well blended. Spread about 1 tablespoon frosting mixture on bottom of each peanut butter cookie. Top each with chocolate chip cookie, bottom side down; press gently. Store in refrigerator. 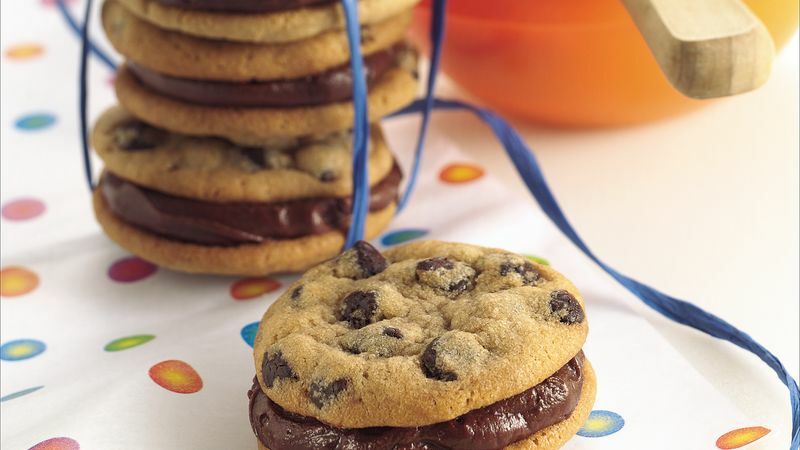 For Mini Double Decker Cookies, cut each roll of cookie dough into 54 pieces. Bake 8 to 11 minutes. Continue as directed, using about 1 teaspoon frosting mixture for each sandwich cookie.